Every room has been lovingly decorated in it's own style. In 1907, Albert Farr and Alice Parkhurst commissioned George Perkins, a renowned Chicago Architect, to design and build a 11,000 square foot Georgian Revival inspired summer home in the town of Brandon, Vermont. Sparing no expense and using the latest in technological innovations, the home, named ‘The Arches” was completed in 1909 at a cost of $75,000. Upon completion, Brandon’s finest citizens were brought to “The Arches” for a grand party. Over 700 citizens were escorted throughout the house, dining on soup and sandwiches in the dining room, followed by ice cream to the music of a full orchestra in the courtyard. inherited the home six years after completion. Miss Farr was noted for her philanthropy, donating both the town library and sewage treatment facility. Branbury State Beach at Lake Dunmore was donated to the state and is now Branbury State Park. Miss Farr was an active State Legislator, involved in the rehabilitation of war victims and a concerned partner in town politics and activities. In 1950, Mrs. Farr’s cousins inherited the home: Margaret, Dorothy, Catharine and Alberta. Margaret, “Marnie” Flowers, was a famed opera singer who decorated her suite in shades of purple. Dorothy and Catharine, “Dor” and “Cam,” graduated from Mount Holyoke and made their fortune as owners of McClellan’s bookstore in Ohio. Forever inseparable, they spent one year working and then traveled to over 200 countries throughout their lives. In 1978, the home was converted into a board and care retirement home. In 1985, it was renovated into the Arches Country Inn. The Shanes, Michael and Melanie, purchased the home in 1991, named it The Lilac Inn and spent the next year and a half renovating to recapture the feeling of it’s original grandeur. In the Spring of 2001, Shelly and Doug Sawyer purchased the inn after searching for two years. It was during their time living in England, that Shelly dreamed of owning a bed and breakfast. When they saw the Lilac Inn it was love at first sight. Vermont, with over 600 bed and breakfasts and country inns, is known worldwide for its hospitality and is often called “bed and breakfast central”. However, most of these properties started life as taverns, stagecoach stops or farm houses and have been adapted for guests. What the Sawyers loved about The Lilac Inn was its unique history as a grand house designed for entertaining. From its inception, the home was built with large guest rooms with ensuite bathrooms, generous public spaces, a commercial kitchen and public bathrooms. Except for the front desk the layout of the inn is the same as it was when it was a private residence over a hundred years past. perfect for outdoor weddings of up to 250 guests. 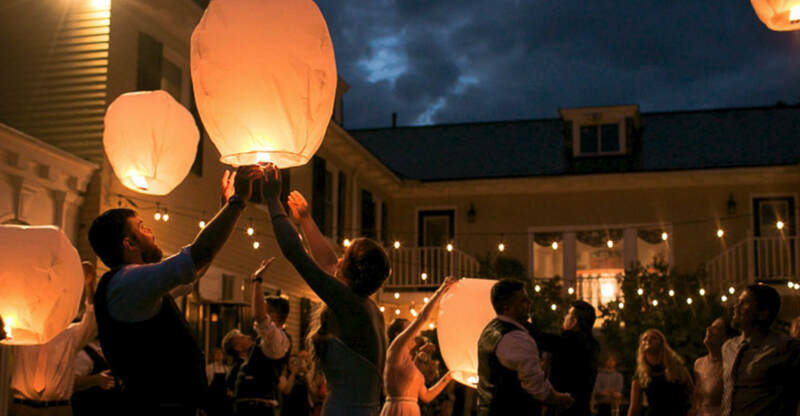 The spacious ballroom is a popular year round Vermont wedding destination for weddings of up to 130 guests. 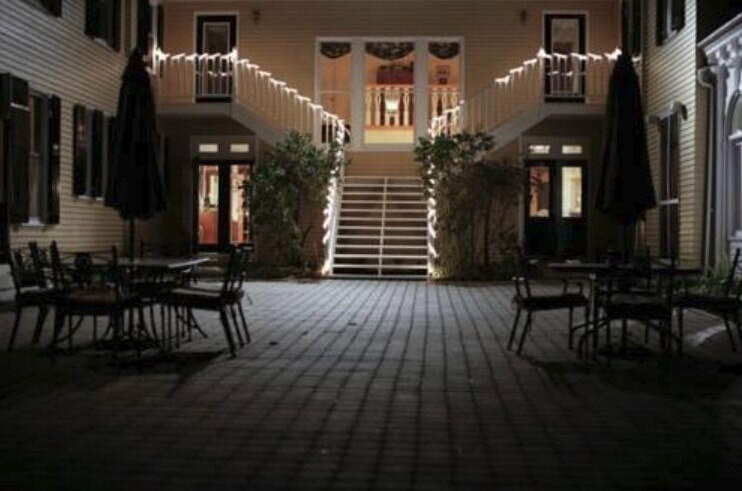 The Lilac Inn has been selected as one of the leading 100 best U.S. wedding destinations by Kathryn Gabriel Loving. Choose from one of our nine individually decorated rooms. ​We offer rooms with king beds, queen beds, twin beds, and rooms with extra beds. All rooms have a private bathroom, individual heat and cooling, cable TV and three feature wood burning fireplaces. Your comfort and happiness is our top priority. The Grand Suite is the largest guest room at the Lilac Inn. It has hosted bridal parties, romantic getaways, and family sleep overs. ​Enjoy a glass of wine by the fire or take a luxurious spa shower in the recently renovated bathroom. of untouched Green Mountain wilderness, and a jewel of Vermont. Unwind in the luxurious king size bed or relax in the original 1909 soaking tub. Named for the elusive and magical time of year that is a Vermont Spring. This bright and airy room will melt all your winter blues away. Spring room boasts a queen size bed and original 1909 soaking tub. Keep family and friends close as this room adjoins the Room 4 Robert Frost room next door. Robert Frost was declared the Poet Laureate of Vermont in 1922. The Robert Frost trail is just a short drive away and dotted with his poetry. This room is a tribute to the great poet who loved New England. The twin beds are from local artisans at Vermont Tubbs. Other features include an original 1909 soaking tub. The room also adjoin the Spring Room. Bright, cozy and inviting are just some of the words guests have used to describe this favorite room. 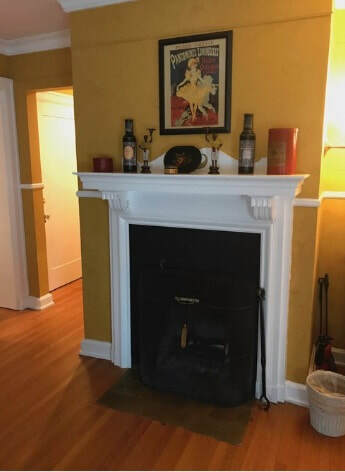 Relax by the fireplace or take a soak in the claw-foot tub. This room features a four poster queen bed and a view of Park Street. 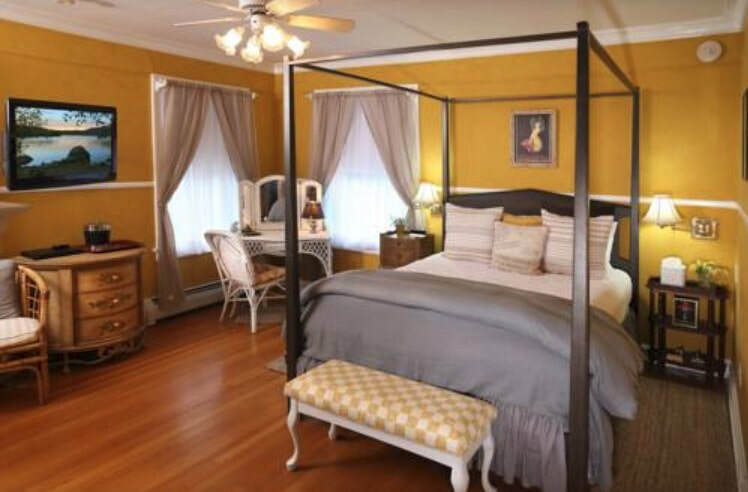 Nestled in a quiet part of the Inn, the Lilac Room features a king size bed and claw-foot tub. In the spring time, the scent of lilacs will entice you to take a walk through the perennial gardens. Named for the builder of the Lilac Inn, Albert Farr. 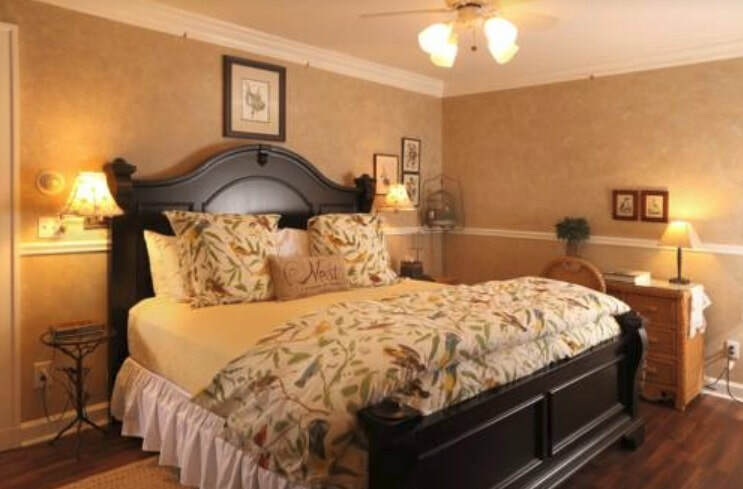 Originally used as a second master bedroom, it is one of the more spacious guest rooms. It has recently been updated with a king size bed. Come stay with us and experience the Lilac Inn, a special piece of Brandon history. Inspired by the work of John James Audubon, this room appeals to outdoor enthusiasts. 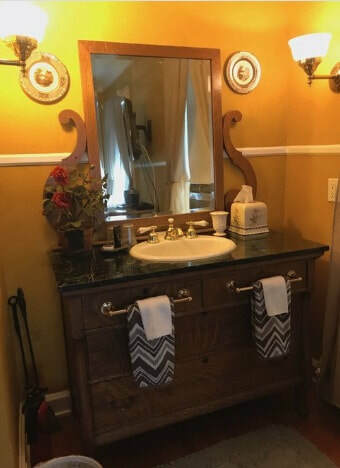 Features a king size bed, writing desk and tile tub and shower. This room is a favorite of repeat Lilac Inn guests. Quiet and serene, this quaint room has a private hallway and over looks the beautiful gardens. Features a queen size bed by local artisans Vermont Tubbs. 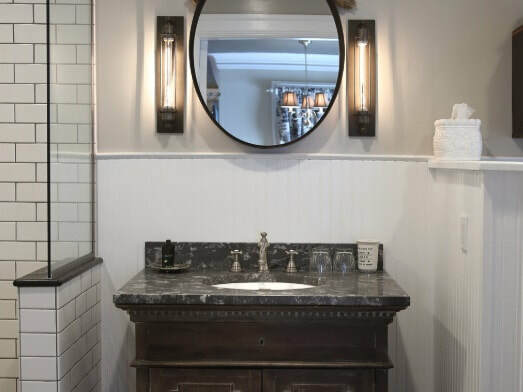 The bathroom has been recently renovated with over size subway tile and barn style shower doors. ​We have a few 2019 dates still available! or something in between, the Lilac Inn is the perfect choice. The Lilac Inn specializes in customized weddings all year round. All of our reception packages are able to be personalized just for you and your dream wedding. Your personal coordinator will be with you from start to finish. The Ballroom seats 125 guests. By tenting the courtyard, we can comfortably accommodate 240 people. apple trees in the grotto, inside on the Grand Staircase or in the Ballroom.